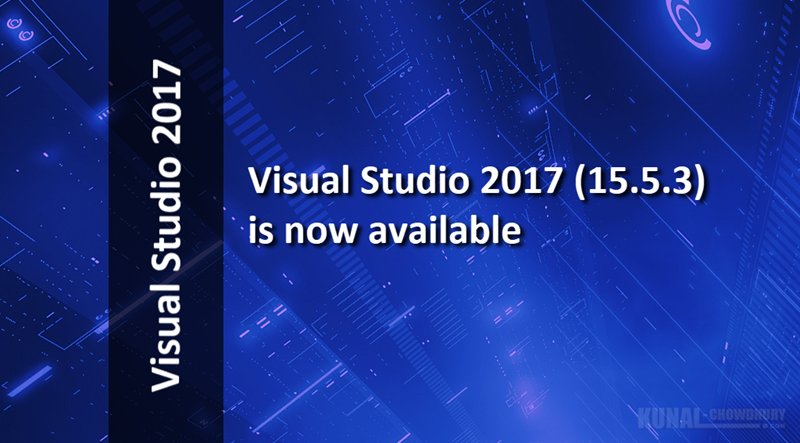 Microsoft released a new update (version 15.5.3) for its existing Visual Studio 2017 installation. If you are currently using Visual Studio 2017, you may like to update it, as it contains few fixes on top of the previous build. If you like to check, what has been fixed in this new update, here's a list of these fixes. Don't forget to check the 'Known Issues' section. Error C3821 in xlocale in c++/clr. Using header inside unmanaged code section of a managed C++/CLI project no longer builds. VS2017 with WDK 10 fails during remote provision KM. Visual studio tools for Unity failed to convert debug symbols after upgrading to VS 15.5. Find new information regarding the Microsoft Security Advisories for .NET Core. CVE-2018-0786 Security Feature Bypass in X509 Certificate Validation Microsoft is releasing this security advisory to provide information about a vulnerability in the public versions of .NET Core 1.0 and 1.1, and 2.0. This advisory also provides guidance on what developers can do to update their applications correctly. This security advisory is also applicable to .NET native for UWP. Do you know? The book 'Mastering Visual Studio 2017' is now available on Amazon and Flipkart? CVE-2018-0764 Denial of Service when parsing XML documents Microsoft is releasing this security advisory to provide information about a vulnerability in the public versions of .NET Core 1.0 and 1.1, and 2.0. This advisory also provides guidance on what developers can do to update their applications correctly. If you have come this far, it means that you liked what you are reading (Visual Studio 2017 version 15.5.3 is now available).